While most investors look to precious metals such as gold and silver as investment vehicles, there are other options available to savvy investors and collectors. Copper prices have been on the rise in recent years alongside those for gold, silver, and platinum, but have remained at levels that are affordable for a wider range of investors. 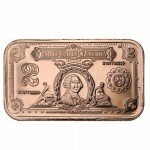 Right now, you can purchase a 1 Pound Copper Bullion Bar from Silver.com. Contains 1 Avoirdupois (AVDP) Pound of .999 fine copper. Simplistic design with a slightly-mirrored finish. Affordable pricing compared to other precious metals. Copper is a commonly used metal in modern society. While gold and silver are commonplace in jewelry and other industries, copper is used for a wide variety of purposes. The most common use for copper is piping in residential and commercial structures. Copper is well-known for its high thermal and electrical conductivity. Pure copper is very soft and malleable. A common metal alloy found in modern circulation coins, this 1 Pound Copper Bullion Bar brings the metal front and center for its own moment in the spotlight. The primary face of this copper bar features a number of engravings that identify the bar’s contents, while providing information relevant to investors and collectors. In the middle of the bar is a square containing Copper’s atomic number and periodic table of element’s square. 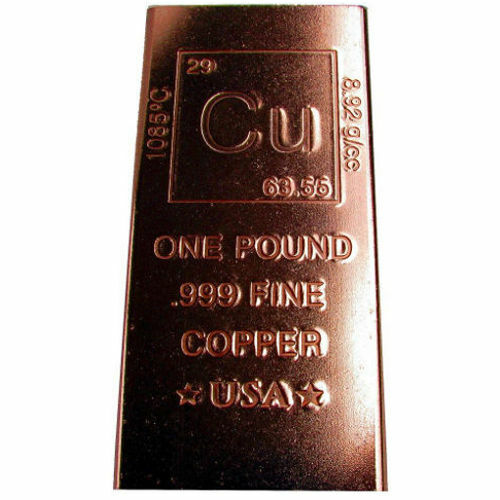 The engraving includes the atomic number of “29” in the upper-left corner, and copper’s designation in the table of elements “Cu.” To the left of the box is the melting point of copper in Celsius, “1085 C.” To the right of the box, the weight (in grams) of the copper bar. Below this information is the weight, purity, and metal content of the bar. An engraving just below this information includes two stars with “USA” engraved in the middle, signifying that these bars were struck in the United States. If you have any questions for a Silver.com associate, we encourage you to reach out to us with those inquiries. You can contact one of our team members on the phone at 888-989-7223, online through our live web chat, and via email. 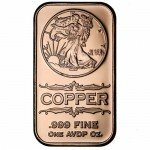 If you are looking for similar products, be sure to check out our full selection of Copper Bars.